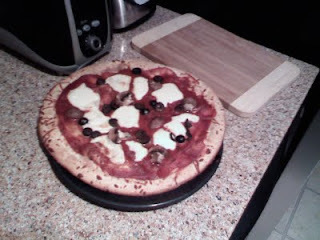 Although the crappy cell phone cam pic really doesn't do it justice, I've got into making homemade pizza lately. This thin-crusted beauty is topped with a delicious tomato sauce, mozzarella, portabella mushrooms, and sliced black olives, all sprinkled with sea salt, onion powder and garlic powder. It's 12" across and provides four very good-sized slices. Total cost to me = $6. Kaching!